The new cleaning device PvSpin allows a swift and economic cleaning of big- surface solar plants that are covered with dirt. Especially solar plants on agricultural buildings with ridge ventilation become dirty already after a short time in operation. This results in yield losses of 15% and more. Cleaning systems that are operated manually are often uneconomic. Cleaning by two cleaning brushes that turn in opposing directions. Robust and powerful water hydraulic axial piston rotating motor. Material-protecting cleaning, as the soiling are soaked before being removed. The device can be operated from the ridge by one operator (securing in the roof edge areas, additional guidance in case of very flat roofs or big rafter lengths). 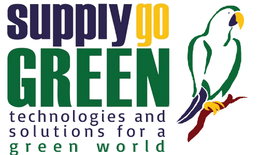 SUPPLYgoGREEN technologies for a green world is developing new markets for TOP Solar Team. If you are interested in this technology, and it is not yet available in your country, please talk to us. It will be pleased to inform you how to get it.